A while back I was gifted an Escapade by a good friend of mine with the instruction to go and have fun and adventures. Up until now it’s been in singlespeed commuter mode so despite getting some very good use, I’ve yet to fulfil the fun and adventure part of the deal.This summer I set out to change that. The heritage of my Escapade steered me towards choosing a long distance route. My want for a personal challenge and my obstinate attitude of my legs to climb hills meant it needed to be a lumpy one. 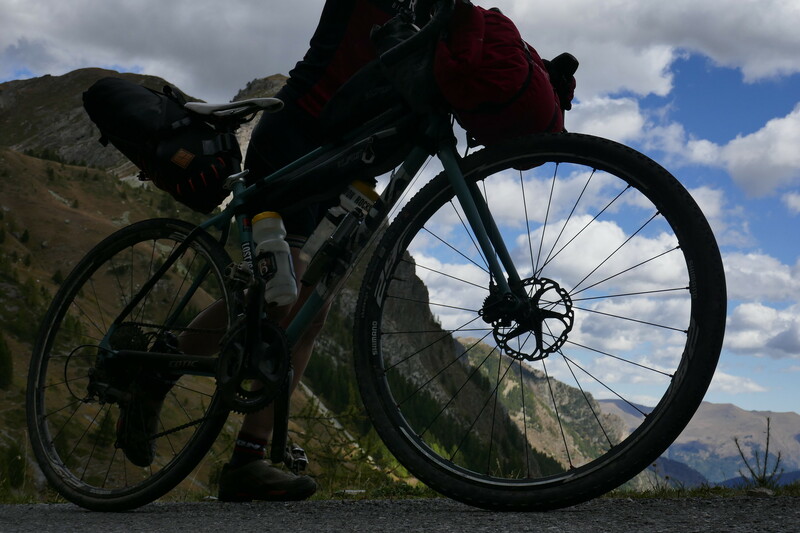 The Turino-Nice Rally, now in its second year, is a self-supported ride which climbs 18,000m over 700km across the Alps. 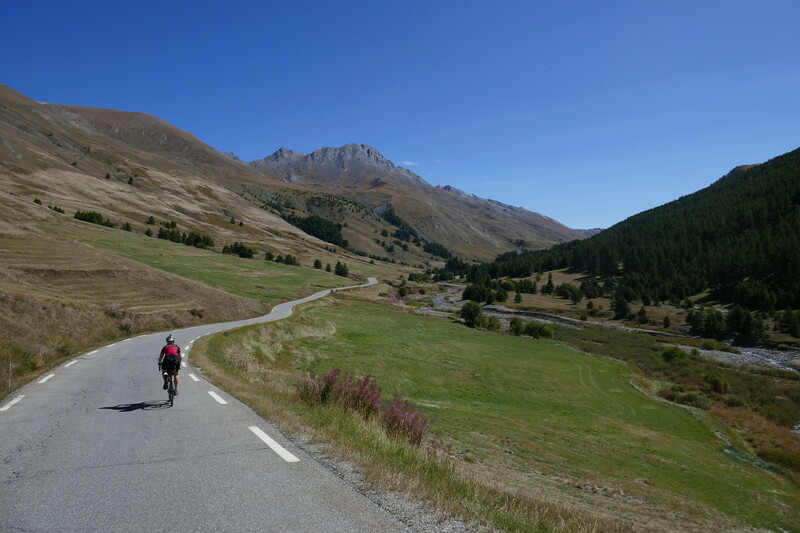 Part road, part gravel, part off-piste with a flexible route depending on bike, ability and will, it perfectly matched the brief for me and my Escapade. I persuaded my Other Half this would make for a good summer holiday and plans were made for the trip. I was never going to make this in singlespeed mode so upgraded to a 2x11 set up. With shifters and mechs all fitted it then dawned on me that a road cassette wasn’t going to work with my 29er MTB wheelset. With little time – about two days before departure – and funds to change the wheels then I looked for other options. And salvation came in the shape of a little converter (and 18 Bikesexcellent service) which increased the reach of the rear mech to swallow an 11-40 cassette. 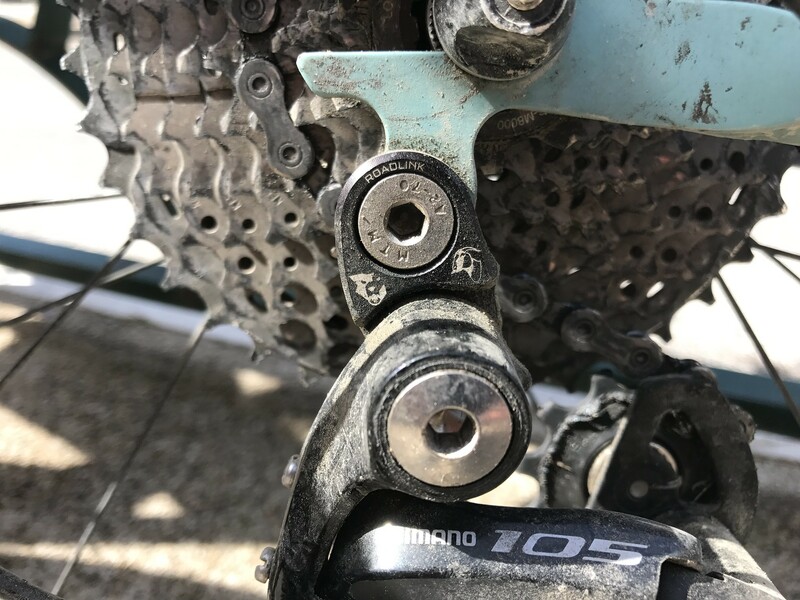 At the time it seemed a real bodge: the range of gears exceeded that of the mech which left we with miles of slapping chain, I couldn’t run certain gear combinations and it looked rather Frankenstein. But it worked and so with few other options, it would have to do. We couldn’t make it to Turin for the official start of the ride. And to be honest, whilst I know we that means we missed out on a big part of what these rides are about – the people, the stories, the comradery – it rather suited me too. I can be a bit of a loner when it comes to riding my bike and I was quite happy to do this one at my own pace with only my pre-chosen riding partner for company or to find space from as required. 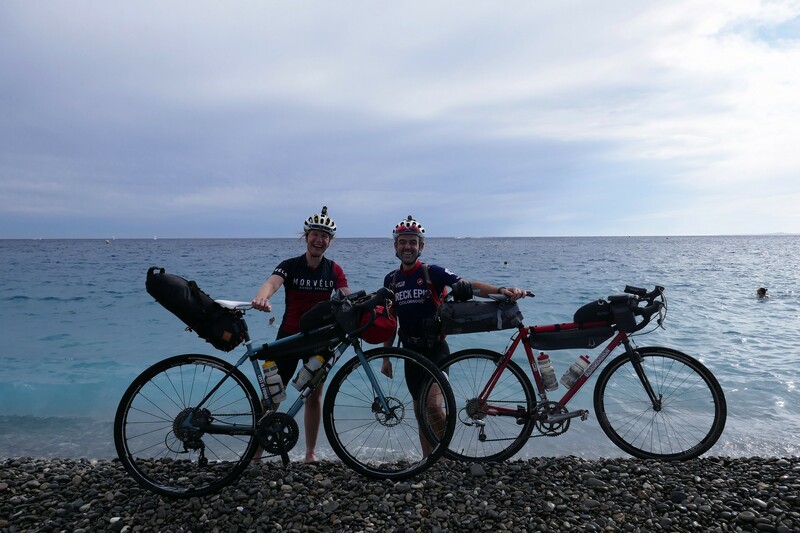 We were aiming for a steady six days of riding but without a concrete deadline for a flight home, had enough flexibility to take longer if need be. It felt rather arbitrary dividing up the route into chunks and we had no real idea of how our 3,000m climbing a day was going to be comfortably achievable or beyond the capability of our legs. As we rolled out from Turin on day one, with the mountains looming ahead, I was part eager to get to the climbs and get stuck in, and part wanting the flats to last to get some easy miles into my legs.But even on the flat tarmac roads the going wasn’t that easy with the extra weight from the bike packing kit quite noticeable; I was filled with excitement and trepidation for our journey ahead. After a couple of hours we started to climb. And it was by no means a gentle introduction. The 10% plus incline had me down in that teensy-tiny gear that I never intended to have and I was only just able to winch up the hill. As the tarmac’d surface ended the gradient mellowed a little but the challenge remained as the deep gravel sucked the momentum from our wheels for the rest of the 1,000m gain. We were wowed by the views from the first of our colles (Italian; cols for the French). In the clear skies we could see miles and miles off the Columbardo to mountains ahead and the flat expanse behind back towards Turin. We marvelled at the sight of the switchbacks we had just climbed and were excited about those which would take us down the other side. Across the six days of our trip these moments seemed only to get more impressive with differing terrain, scenery, weather and levels of exhaustion and exhilaration all influencing the views. As the days and cols went by there were times that I climbed more strongly than I’ve ever done before, settling into a steady rhythm as the meters and kilometres, minutes and hours ticked by. And at times I climbed like a drunken walk home; for every half, stumbling step forwards there was a sway and stagger from side-to-side and a small topple backwards. And then there were the descents, it only really sinks in quite how far you’ve climbed when it takes you over an hour of descending to get down the other side. Our timing through towns and villages was lousy all week. The end of the summer season meant most cafes and shops were only open certain hours of the day and rarely the ones when we rode by. We spent most the week eating cereal bars, yesterday’s pastries and supermarket cheese and bread. On our fourth day, having finished our supplies of muesli bars with two for dinner the night before and another two for breakfast that morning, we were rather relieved to find a small village café open at the base of a 1,200m climb to the Colle del Morti. After half an hour of their opening we had polished off the day’s stock of croissants and half of the polenta cake with several coffees to wash it all down. Guided by our original schedule and pushed on by sudden end of summer warmth in the few days since we started, we made good progress racking up the hours and distance in the saddle. This gave us a rather leisurely last day down to Nice where we took a little more time to take in the views as we descended our way to the finish. Theoretically this was a great last day; in practice I rather missed the challenge of the long days and climbs that had gone by. The Escapade performed flawlessly all week despite being laden with my kit and tired legs. The ever changing terrain means there is no ideal bike for the Rally but if I did it again, I wouldn’t change much about my set up. I ran 35mm 700cc gravel tubeless tyres on my MTB wheels and suffered just one puncture. On some of the rockier descents a smaller wheel and a fatter tyre would have been nice but there’s enough fast rolling tarmac to balance things the other way. Hydraulic disc brakes were a real pleasure and I was consistently grateful for their power and control, with my OH’s cantis a stark comparison. And for my last minute MTB cassette to road mech fix and the tiny gears for big cols, I will always be grateful. Thanks to Tom and Jenn for the bike and instruction, and to James of the Torino-Nice Rally for all the meticulous route planning and great week. I vow this to be the first of many proper adventures on my Escapade.